Shopping for Breaking Bad / Better Call Saul Vehicles: Die-Cast Metal? Finally! You can own the Los Pollos Hermanos Food Distributors Inc. truck as seen in the hit Breaking Bad TV series! This Breaking Bad Los Pollos Hermanos 2013 International Durastar Box Truck 1:64 Scale Die-Cast Metal Vehicle is a beautiful re-creation of the truck, and even includes the iconic graphic on the side. 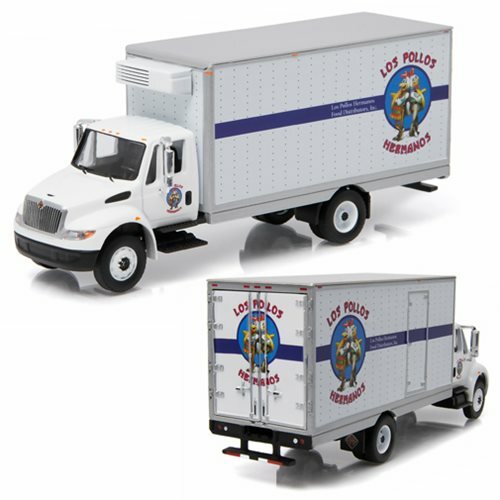 A 1:64 collectible vehicle, the Los Pollos Hermanos truck is made from die-cast metal. Ages 17 and up.